July 1949. It’s not just the super-extravagant, strikingly asymmetrical gown (surely a Paris creation?) that’s escaping from the privations of World War II. It’s the photographer too. Born in Russia, Constantin Joffé, moves to France as a young man, fights in World War II, is captured by the Germans and interred in a concentration camp, from which he is released because his wounds prevent him from doing hard labour. He moves to the US (just like fellow-Russians Alexey Brodovitch and Alexander Liberman) where he becomes a professional photographer employed by Condé Nast. He also writes a book, We Were Free, and an article, In a German Prison Camp, for Life Magazine, about his experiences. 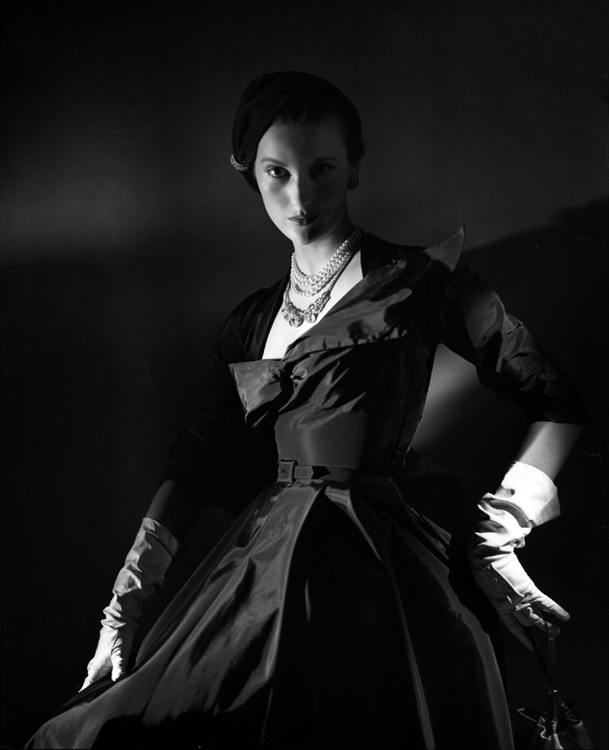 The model is Mary Jane Russell.